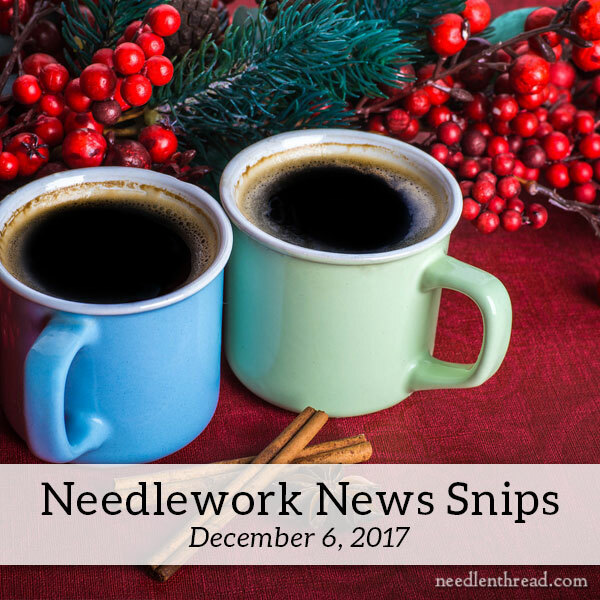 Needlework News Snips for December! Happy Wednesday, and happy Feast of St. Nicholas! When I was growing up, we would leave our shoes out the night before December 6th, and in the morning, we’d have treats in them! So, today, a few treats! I know it’s Wednesday, and I don’t usually do Needlework News Snips midweek, but there’s a lot of fun stuff going on out there in needlework world that I’d like to share with you – inspiration, ideas, resources, news – and since the schedule is thrown off a bit with A Stitcher’s Christmas through the rest of December, I figured today is as good a day as any! Besides, who doesn’t need a mid-week break with a nice hot cup-of-something and a chat with a friend? So, pull up, get cozy, and let’s have a bit of a natter! This is going to be pretty random! Ready? Over on Luzinne Happel’s blog, which is devoted entirely to the art of Schwalm whitework embroidery, you’ll find a series of little Schwalm bits going on! It’s her Advent calendar! Each day, Luzinne publishes photos of beautiful little pieces of Schwalm embroidery, and at the end of the photos, she has a list of materials and stitches involved. So far, six have been published. Why not enjoy a little browse through her whole Advent calendar so far? It’s quite delightful! And just like a kid anticipating opening the next window on the Advent calendar, I can’t wait to see what tomorrow brings! Anna Scott, an embroidery designer and teacher in Australia, recently published this tutorial for detached chain stitch over on her blog. I love the piece she used it on! The goat is magnificent! And…incidentally…she turned it into an adorable bag, which you can see here. Threadlines is a blog written by Susan Rhodes, textile maker and tutor, in the UK. Two articles that caught my eye recently: her crewel work for autumn and this article on her visit to the William Morris Gallery in Walthamstow. Her blog is a fun ramble! Go explore it! From the blog of Sydney Eileen, here’s a nice article on freehand blackwork embroidery patterns, with patterns! She also delves into the basics of Elizabethan freehand blackwork embroidery. This is the non-counted blackwork that was typical of the Elizabethan era. Good article and fun stuff! New Book to Look Forward To! Wow! A lot of good needlework books came out in 2017 – and more are slotted for 2018! I’ve recently had a chance to look over the RNS Book of Embroidery coming out in 2018. Have you seen it on the pre-order lists online? It’s in the top spot on my Needle ‘n Thread Recommendations page on Amazon, here. I’m thinking they should have called it the RSN BIG book of Embroidery! Why am I excited about this book? 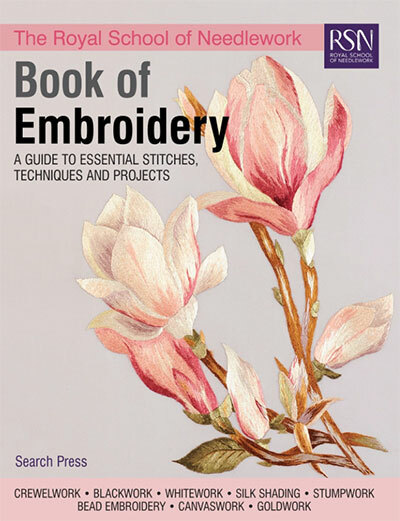 Because it’s the ideal book for the embroidery enthusiast who is interested in exploring and really learning the foundations of core needlework techniques. The book is a large format compilation of the RSN essential stitch guides. So, in that sense, the content is not all new. While there’s new stuff on finishing and some beginning and end material, overall, each section is simply the stitch guide, reformatted, large, easy to read and to follow. It’s a great all-in-one book! It is certain to be very influential on new generations of stitchers in the years to come, and a wonderful learning resource for needlework enthusiasts worldwide. I’m looking forward to it! There are a couple other books that I haven’t had a chance to review for you yet, that are on my recommendations page on Amazon. If you’re building a wish list for Christmas, you might take a look! I’m always excited when I find a good linen available for surface embroidery. French Needle now has Graziano linen (6262). It’s a nice white linen for all things surface embroidery. It’s a plain weave, and perhaps a tiny bit lighter than Alba Maxima. It tends to have a little more of a slub to it, here and there, that’s typical of linen. It’s nice! I like to make very short little overview videos when I manage to produce an e-book, mostly to let my subscribers on my YouTube channel know about it, if they’re interested. Here’s my Twelve Trees of Christmas video. It’s short and sweet – 1 minute, in fact! If you’re reading this in your email, the video won’t show up in the newsletter. You can see it here! I thought the music was appropriate! Speaking of Twelve Trees, rumors are rolling on about a lot of you who have already stitched up a tree or two! I would love to see them! For example, Hendrika took a pre-made star ornament that you see above, and stitched Tree #7 on it. 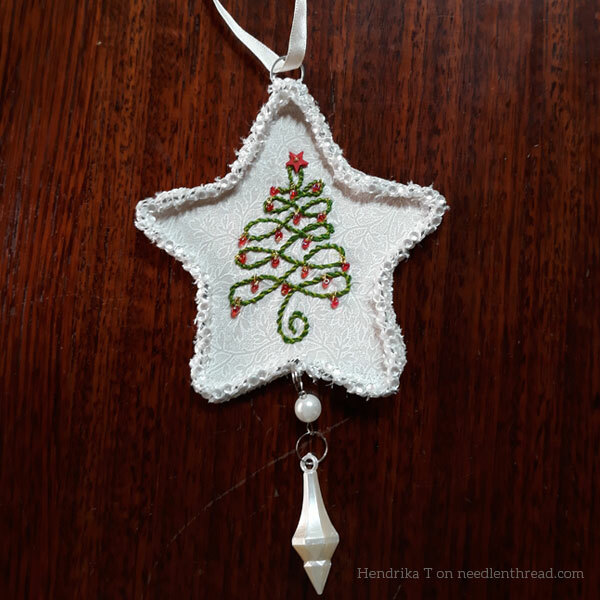 She altered the stitch choice, using whipped chain stitch instead, she attached her beads using little loop-like stitches of fine metallic thread (so the beads look like they’re hanging off the tree), and she placed a tiny button star at the top of the tree. I love it!! There are a couple fun ways you can share your Twelve Trees photos with me! Social media is probably the quickest way, if you already have a Facebook or Instagram account. If you’re on Instagram, just tag my handle @needlenthreadmc and use the hashtag #twelvetreesforchristmas when you post your photos. On Facebook, you can tag me, too. I have a Needle ‘n Thread page on Facebook here. And you can always send a friend request, if we’re not connected yet! You can also connect with me on Pinterest here and send me a notification when you post your Twelve Trees photos there. If you’re not on social media, you can share photos by dropping me a line here at Needle ‘n Thread, and I’ll let you know how to share them. If you already subscribe to the newsletter, you have direct access to me – all you have to do is hit reply to any daily newsletter in your inbox, and you can send along a photo or two! Today’s the last day to pick up Twelve Trees for Christmas at the special launch price, so if you’re interested, it’s a good time to get it! Do You Use Evertite Frames? If you were accustomed to purchasing Evertite frames through Stitcher’s Paradise in Florida, you will be sad to know that, after 15 years in the business, the owners have retired. The shop closed in November. You can still find Evertite’s available online, though, through various needlework shops. I usually get mine through Needle in a Haystack in Alameda, CA. You might also check A Stitching Shop in Denver, CO, to see if they carry them. They’re not on their website, but that doesn’t mean they don’t carry them. You might have to call. With Tanja Berlin’s recent website overhaul and the give-away for her goldwork kits that I’m currently running here as part of A Stitcher’s Christmas, I’ve had a few inquiries about where to purchase goldwork threads in the UK, retail. I think Golden Hinde is probably the place to start. Even if you don’t live in the UK, you’ll find they carry a massively wide assortment of real metal threads of all types and ilks and colors and textures, plus fabrics and all kinds of tools and goodies and whatnot for the embroidery enthusiast. The folks at Inspirations Magazine have very smartly consolidated their brand, magazine, publications, everything into Inspirations Studios. Along with the consolidation for branding purposes, their new website – which seamlessly folded over from the previous Inspirations website – now sports the magazine, partners, books, kits, and… all their newsletters in easy access format. Worth a browse! And if you’re wondering what to beg from Santa for Christmas, I’d say a subscription to Inspirations Magazine should be at the top of your list – right under “Peace on Earth,” of course! That’ll do for today’s meander. It was longer than I intended! Sorry, Charlotte! 🙂 I’m looking forward to that one, too, although admittedly, I have the complete set of the essential stitch guides. I really like the idea of having everything in one book, with a larger layout, though. I have just sent in a mega order to Sew and So here in the UK to get a few extra threads to stitch your lovely trees (ok, and some other things, too). Failed to find floche at all, but all is not lost! I can wrangle a few strands of floss instead, or perhaps use some pearl cotton. My 4″ hoop is wrapped and ready. That’s great, Serinde! If you substitute floss for the cable plait stitch in tree #7, I’d go with three strands instead of two. Two ends up looking a little sparse on that one. But with all the other stitches that floche might be used for (or coton a broder 25 aka “soft cotton”), two should do! But feel free to play around with substitution quantities of strands. Sometimes, you might like to go heavier, sometimes lighter, depending on the look you want. Thanks for the news about Stitchers Paradise in Miami. I didn’t know they’d closed. I always planned to go there during family visits to the Doral area and never had the time. There’s a moral there somewhere! Oh I love that whitework lampshade. I purchased Luzzine’s book and it’s wonderful. Gives me a great idea fora replacement for a very scruffy lampshade in my house. I love Sotema linen! And I love snip it’s! Alarming isn’t it how many needlework shops have closed this year? An appalling trend, if I have ever seen one. Hi, Holly – Yes, it is rather surprising. With many of them, I wonder if it has to do with a lack of online marketing? Or perhaps putting resources into stocking items that don’t compete well with the online markets. I’m pretty convinced that any small business today that doesn’t get with it when it comes to an online presence – either to sell online or to market themselves as a destination online – will struggle. Oy, but it’s a project that will have to wait. Too much to do already! That sounds like a great idea, Liz! Yes, I love Luzinne’s work – it’s so pristine and pretty! Oh dear. I made the mistake of checking out your book recommendations on Amazon. Shouldn’t have done that. Thanks Mary – you’re SUCH an enabler!!!! LOL! Sorry, MaryAnn! :-/ Books – they get me every time! The trees video is lovely, thanks. Very interested in all your bits and pieces today. Great browsing and learning info. I always enjoy reading your blog! You educate and inspire me! Oh, wow, Kathleen!! Lucky! I have the book on May Morris, it’s terrific! Are you of Dutch heritage? While living in the Netherlands, we enjoyed Sinterklaas on Dec 5/6. Local school kids would parade around with lanterns and visit neighbors’ homes while singing songs about the saint. We were supposed to reward them with treats, usually kruidnoten and candy. Then they would place their shoes out, and leave a carrot for the Saint’s horse. My husband and I were on a bus heading in to Alkmaar one time on the day Sinterklaas arrived with his Piets… the Piets actually invaded the bus and showered all the passengers with packets of treats. Nothing to do with needlework, but your mention of putting out your shoes made me smile at the memory. The cross stitch I did of my daughter’s family and ALL of their pets is my favorite because each stitch is made with love & Joy! I planned them on graph paper and tried to personalize each. Next Next post: A Stitcher’s Christmas #4: Slate Frame & Needle Minder!